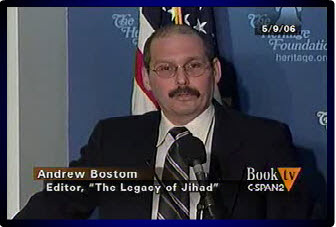 Andrew Bostom talked about his book The Legacy of Jihad: Islamic Holy War and the Fate of Non-Muslims, published by Prometheus Books. He discussed the history of Islamic fundamentalism throughout the Middle East, the treatment of non-Muslims living in Islamic countries, the threat to Israel posed by fundamentalists in the region, and the war on terrorism. He was joined in discussion by Laurent Murawiec and Ariel Cohen.